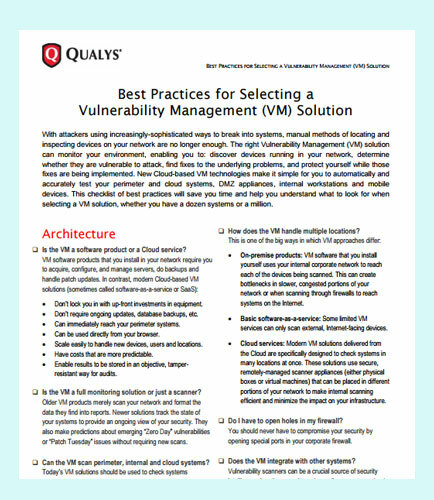 "The Buyer's Guide to Vulnerability Management Solutions"
A complete Vulnerability Management (VM) solution can monitor your environment, enabling you to discover devices running in your network, and determine whether they are vulnerable to attack. The VM solution helps you to find fixes to the underlying problems, and protect yourself while those fixes are being implemented. This whitepaper provides insights on the best practices that will save you time and help you understand what to look for when selecting a VM solution, whether you have a dozen systems or a million. Is the Vulnerability Management a software product or a Cloud service? How does the VM handle multiple locations? What are the top features to look for in VM scanning? Can the VM use authentication for deeper scanning? Can the Vulnerability Management tailor reports to different audiences? Does the VM offer predictive analysis? What information about the underlying cause does the VM provide about each vulnerability?